Smartphones are the wave of the future, and that technology will only continue to become more streamlined as time goes on. Many new technological breakthroughs are only a few years away. Some of these new changes will be coming sooner than others, and they are detailed below. Imagine that you are vacationing in a historical city, and want to know more about the buildings around you. Using your phone’s camera, you will be able to take a picture of the area around you and receive numerous informational links, ranging from ratings and menus for restaurants to the history behind a museum exhibit or building. Augmented reality will combine visual recognition with a GPS chip in order to give you real-time updates on the places you go and the things you see. Such technology will likely become a must-have among vacationers and business travelers, as it can speed up the decision-making process when deciding where to go in a foreign area. Even the most advanced smartphones are currently limited by their plastic casing. 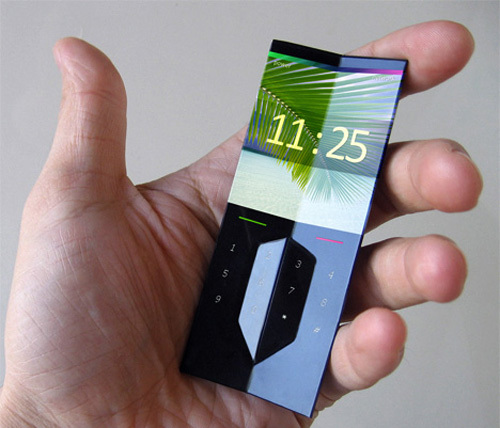 Currently in development by several companies, however, is the concept of a flexible screen that can be bent and altered to fit a user’s preferences. Using flexible but durable plastics, these phones would be able to be folded up to fit better in your pocket. Some models might even be wearable as wristwatches or armbands, removed only when you need to make a call. With the use of magnets on a case or a simple adhesive, such phones could also be mounted on refrigerators or cabinets for easy storage when they aren’t needed. The world of portable video games has already toyed with the idea of a 3D screen that doesn’t require glasses, producing the Nintendo 3DS system. With higher capabilities and downloadable apps, smartphones have the possibility to go even further, potentially even projecting 3D holograms. These images would allow the editing and remastering of pictures and videos in a 3D environment, giving you more ways than ever to customize your media. This technology also opens the door for viewing full-length movies on the smartphone. As camera technology gets smaller and more powerful, it will soon be possible to use your smartphone in place of an LCD projector during business meetings. Using a built-in digital light projection system and voice commands, phones will be able to project images and videos on walls and screens as needed. This will potentially revolutionize the business industry, as expensive and high maintenance equipment will be able to be discarded in favor of a simple and rechargeable smartphone. These are just a few examples of technologies that are currently in development that you can expect to become regular features of the smartphone within the decade. As technology becomes better and better, the many uses of something as versatile as a smartphone will continue to multiply, meaning lots of great features for the users. James Stanco is a creative designer and a software engineer working for InspireMyCase.com, a popular website where you can design your own personalized iPad case.